Summertime means outdoor activities, cookouts, fun by the pool, and taking care of a vegetable or flower garden. While it’s entertaining to enjoy the many activities a backyard provides, one thing you don’t want to share the fun with is a stinging wasp. To keep your yard wasp free takes a little planning but well worth it to keep NJ stinging insect control working at peak performance. Safety is important when working with wasps. 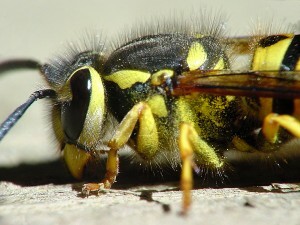 Unlike bees that don’t usually sting unless provoked or their nest is in danger, wasps don’t need a reason to attack. • Blend lemongrass, clove, and geranium essential oils with dish soap and water. Put in a spray bottle and apply to target areas where wasps congregate or where they’ve previously had a nest. • Combine 2 tablespoons dish soap with water, place in a spray bottle and coat hanging nests. • Planting a mint plant will help dissuade wasps in the garden. A more potent option is blending mint oil with water and applying to affected areas. • Seal any cracks, holes, or crevices around doors, windows, siding, or the space where power lines or cables enter the home. When you’ve done all you can to remove wasps but find you need the services of a NJ stinging insect control specialist, all you need to do is call the professionals at Stern Environmental and we’ll take care of it. There’s a lot to be said for using the services of NJ stinging insect control specialists, especially when it comes to wasps. For many, the sting of a wasp can send them to the emergency room. But there’s good news when it comes to wasps and the more than 100,000 species inhabiting the earth. In India, some wasps have a different position in the environment than what U.S. residents experience. Northeastern tribes in India use the stinging menaces as a medicinal treatment for joint pain. 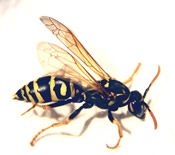 Wasps are captured and prepared for consumption either by boiling or prepared by stir-frying along with vegetables. As strange as that sounds, eating insects is nothing new. In addition to wasps, other insects such as ants, bees, crickets, grasshoppers, even cockroaches, are consumed by humans. But only wasps are eaten to relieve arthritis. Researchers at the North East Institute of Science and Technology (Jorhat, India) have tested extracts from wasp larvae and found that they interact with two of the body’s enzymes. These enzymes are directly linked to eliminating molecules that trigger arthritis as well as other health-related issues. While there’s medicinal potential for an extract of wasps to become an anti-oxidative treatment for health issues, if you have a wasp infestation, the first thing you’ll want is help from the NJ stinging insect control professionals, call Stern Environmental today and be wasp free tomorrow. Wasp nests are generally found under eves, in out buildings, garages, attics and any place where a sheltered overhang makes building a nest appealing. Because of these locations, they can sometimes become a nuisance, especially if the nest is above a doorway or a window, or if they have somehow found their way into your garage and have nested up in the eaves. Your first inclination may be to remove the nest and get rid of the problem. 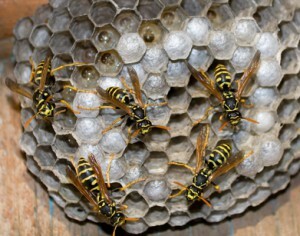 However, the problem isn’t the actual nest, its the wasps that occupy it. You’ll have to deal with them first, and here the basics on what to do. Wait until after dark when all of the wasps are back at the nest for the night. If you don’t, some may survive and cause trouble. Make sure to wear protective clothing which includes heavy-weight pants, long sleeve shirts and eye protection. Use a commercial wasp spray with the longest reach. Stand as far back as possible and spray the nest, making sure you do not inhale the fumes. The best tip of all is to call a professional. Sure, it may cost a few bucks, but it may also save you from getting painfully stung. For more information on wasp nest removal, contact the Stern Environmental Group. We are professionally trained to remove any wasp nest that may be a problem, without all of the hassle. It’s that time of year again to be careful around wasps and bees. These insects can give you a nasty sting, and if you just happen to be allergic either always keep some Benadryl antihistamine around to counteract any adverse reactions fast. If any of the symptoms after a bee or wasp sting include trouble breathing, being faint or feeling dizzy, hives and/or a swollen tongue, call 911 immediately. Safety first is always the best medicine. Ice it — Use ice to control swelling. Elevate arms or legs if they were stung. Treat the sting — Take ibuprofen or acetaminophen if the sting is painful. Apply a baking soda paste or calamine lotion to the affected area. Take an antihistamine (Benadryl) for itching relief. Keep it clean — It may take several days before the area returns to normal, so wash it regularly and keep it clean to avoid infection. If the site does not heal, it becomes inflamed or you have any doubts about the persons health and well being, call 911 or go to your local hospital emergency room. 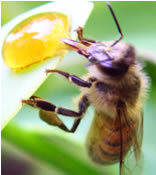 For more information on bee and wasp sting treatment, contact the Stern Environmental Group. We have the latest on how to avoid these pests, and can answer all of your wasp and bee related questions.